As he went through this list, it occurred to me that he was describing a defensive sector, one that is resilient and has a growth component but still has many of the characteristics of a defensive investment including cash on hand, pricing power, a wide moat (stickiness) and non-correlation. All of these factors tend to reduce risk. Another aspect of a defensive sector is that it will grow but not as fast as more "rocket-stock" oriented sectors. For example, the semiconductor and networking sectors have outperformed the software sector this year. 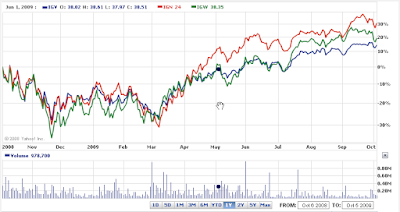 We compare them in the chart below with the sectors represented by the iShares Software ETF (IGV), the Semiconductor ETF (IGW) and the Networking and Media ETF (IGN). At the worst points in the downturn, software managed to do a bit better than the other two sectors though they sometimes traded places. At no time, however, was software the worst performing sector. Subsequently, software delivered the kind of growth tech investors generally expect in return for the kind of volatility and risk tech often exhibits. The lesson here is that if you are building a tech portfolio, it is important to include the software sector either in the form of an ETF like IGV or via a carefully researched selection of software stocks. It can help smooth out the overall performance and provide some confidence when the economic environment gets shaky.